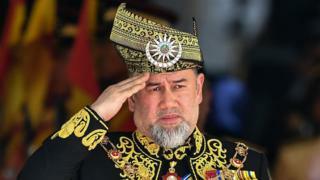 Malaysia's king, Sultan Muhammad V, has unexpectedly abdicated in an historic first. It comes amid intense speculation about Muhammad V's private life following reports that he has married a Russian. "His majesty tells the people of Malaysia to continue to be united to maintain unity, tolerance, and work together," a statement from the palace said. It added that the king, who took the throne in December 2016, was "ready to return home to the state of Kelantan". Perak Sultan Nazrin Muizzuddin Shah, who was Acting King while Muhammad V was on medical leave, will continue as acting king before a new monarch is selected by the Council of Rulers, the Straits Times reports. The top job is passed between nine hereditary state rulers, with a rotation happening once every five years. Despite this, the role is accorded considerable prestige, particularly among the country's Malay Muslim majority, for whom the king is seen as upholding Malay and Islamic tradition. Criticism deemed to incite contempt of the king can attract a jail term. The current Prime Minister Mahathir Mohamad, who returned to office in a shock election victory last May, had a tense relationship with the Sultans during his previous governments, when he attempted to limit their authority, the BBC's Jonathan Head reports. Last week, he warned that all Malaysians must be bound by the law, whatever their status, our correspondent adds.